of the Northern Hemisphere. Somehow, the native Americans knew how special this land was, so they called the unglaciated area "The Great Metatoomie, or "God's Country," and kept it in high regard. Following the American Revolution in 1783, the United States displaced Great Britian (who had only displaced France in 1763) as the official owners of the land. The U.S. Government was poorly organized and administered at that time, due to the weaknesses built into the governing base, the Articles of Confederation. In fact, the weaknesses were so significant that our Founding Fathers wrote the U.S. Constitution in 1787 to replace them. It is interesting to note that only two laws of lasting significance were passed during the period of Confederation-the Land Ordinance of 1785 and the Northwest Ordinance of 1787. The 1785 law created the land system of 640 acres to a section (one mile by one mile) thirty-six sections to a Township and one section per Township (Section 16, in most cases) for the support of public schools for all people. The Northwest Ordinance identified the land north of the Ohio River and east of the Mississippi River as the Northwest Territories and stipulated that, after a period of time under Federal control and after attaining a population of at least 60,000, a portion of the Northwest Territory could petition for statehood as a full and equal part of the USA. No fewer than three nor more than five states could be created under the Northwest Ordinance. It was in that manner that Illinois became a state in 1818 with its first capitol-a tiny, two story house in Kaskaskia. While those brilliant and far-reaching laws were being passed under a failing form of government, this area was still not a frontier, but a pristine wilderness. And, it was only two long lifetimes ago. When the United States purchased the Louisiana Territory from France in 1803, a NEW Northwest was gained, so the area known as the Northwest Territories became forever known as the OLD NORTHWEST. Old Northwest replicated in miniature. With the age of steam on the great rivers and the blazing of the first wagon road to Galena, the Kellogg Trail, Galena became the metropolis of the upper Mississippi. People were mining lead so vigorously that slavery was practiced in the mines for a time. A stop was put to that under the leadership of the famous Methodist Circuit Rider, Peter Cartwright, but some slave quarters still exist in Galena to this day. At the time of the Civil War, Galena Congressman, Elihu Washburne, got an embattled Illinoisian, President Abraham Lincoln, to appoint an unknown retired West Pointer, Captain U.S. "Sam" Grant from Galena as a Brigadier General. Grant's brilliance led to his eventual command of all Union Armies and to Civil War victory. Galena glowed with pride (with a few notable exceptions). 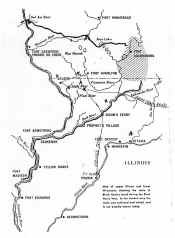 Following "THE" war, Galena, along with the entire area, became a lovely agriculturally based area with pretty towns, pictures, picturesque farms and a declining number of mines. Sleeping quietly in one of the backwaters of history, Galena was blessed by not having enough money to "modernize". Blessed? Yes, blessed. Eventually the area became discovered for the beauty of the unglaciated hills and the living museum quality of its towns, especially Galena. In spite of the decades of lean years, the preservation of this special area for the people of the late 20th and 21st centuries must be called a blessing. service, unsurpassed in this beautiful area we call home. in the future will together allow the company to further grow based on that motto.